This report summarizes an initial stage investigation into wearable sensors for transportation research applications. The Federal Highway Administration (FHWA) has observed significant activity in this area and seeks to obtain an understanding of the breadth of uses that researchers and practitioners envision for this technology, both now and in the future. Staff from the John A. Volpe National Transportation Systems Center prepared this report on behalf of FHWA’s Exploratory Advanced Research Program. The authors of this report discuss research into air quality, physiological, and activity sensors, which have specific transportation applications and arc fairly well-developed. The authors include a summary of observations made by the project team regarding the use of wearable sensors for public sector transportation research. Wearable sensors, transportation, technology, air- quality sensors, physiological sensors, activity sensors, location sensors, smartphones, consumer devices, commercial products, tracking, data collection, passenger flow, transit planning. Figure 1. Test array of low-cost sensors. Figure 2. Evaluation of an industrial hygiene volatile organic compound sensor for citizen science value. Figure 3. Deployment of a novel volatile organic compound sensor for evaluation. Figure 4. 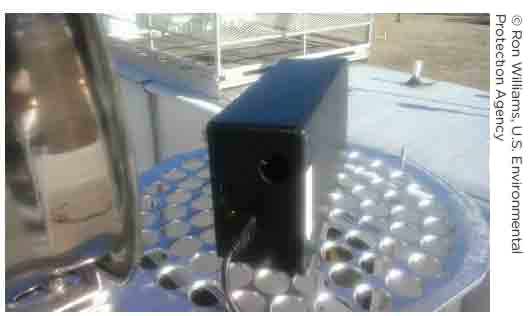 Deployment of a particulate matter sensor in a near-road test bed. Recent advances in hardware, connectivity, and data analysis have converged, making cheap and reliable wearable sensors available to transportation researchers. These advances make fine-grained data collection possible, where data fields are subdivided into multiple fields for detailed analysis. Researchers can analyze each field in isolation to address a wide variety of transportation research questions, allowing for new forms of research. The authors of this report document an initial stage investigation into wearable sensors for transportation research applications. The Federal Highway Administration (FHWA) has observed significant activity in this area and seeks to obtain an understanding of the breadth of uses that researchers and practitioners envision for this technology, both now and in the future. Transportation agencies now have a wealth of new tools and techniques at their disposal to measure key variables at several scales. Staff from the John A. Volpe National Transportation Systems Center prepared this report on behalf of FHWA's Exploratory Advanced Research (EAR) Program, which focuses on longer term, higher risk research areas with a high payoff potential. For this report, the project team focused on air quality, physiological, and activity sensors, which have specific transportation applications and are fairly well-developed. The project team concluded this report with a summary of observations regarding the use of wearable sensors for public sector transportation research. Wearable sensors can be defined as sensors that are small and robust enough to be carried directly on a person's body, such as a wristband or jewelry, or built into a smartphone. They are frequently used to collect data on environmental, physiological, activity, and location variables. Miniaturization and cost reduction of sensors, along with improvements in wireless connectivity, have led to an explosion of off-the-shelf consumer devices. Consumers and corporations track physical activity, sleep patterns, travel patterns, and more, and the data collected are feeding "big data" analytics and enabling new fields of research. Although commercial products are already in wide use, active research into more sophisticated sensors is ongoing. Regardless of format, wearable sensors collect data for one or more variables and are carried on a person's body. More robust multimodal travel-behavior surveying. This would allow measurement of passenger travel to the same degree as parcel freight on a total trip, door-to-door basis, unlike current intermodal travel and travel by multiple services, which are not easily studied. Increased understanding of passenger flows and facility crowding. This would improve transit facility planning and operations. Achieving a better understanding of multiple data fields (i.e., fine-grained data) related to transportation impacts. This could be accomplished through combined physiological and environmental sensors that monitor the wearer's travel patterns, localized air quality, and physiological markers. Monitoring local residents' exposure to transportation-related environmental impacts in remote areas. These impacts are difficult to observe with traditional monitoring equipment. Acquiring a fuller understanding of the relationship between transportation and health. This could be achieved by monitoring individual travel patterns, physical activity, and health indicators. Assessing risk factors for transportation workers. This could be achieved by tracking environmental exposure. Improving assessment of operator fitness for duty (e.g., fatigue). This could enable the development of condition-based, rather than time-based, "hours of service" regulations. The project team conducted a research scan and identified a group of researchers who are developing technologies and strategies for wearable sensors designed to collect data through personal monitors. (1) This follows earlier initial stage efforts in this topic area, including a literature review on wearable sensors designed for assessing transportation impacts (from 2010 to 2014). The literature review is included in Appendix A. 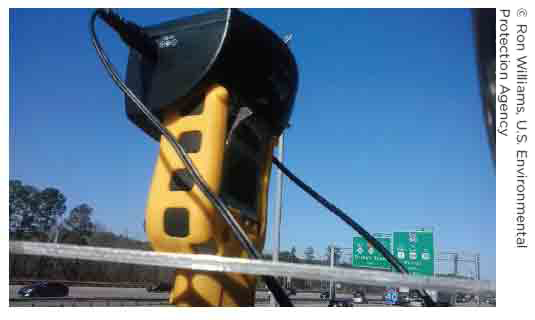 The project began in the spring of 2015 when the project team held discussions with several FHWA researchers to learn about gaps in existing sensors and how they thought wearable sensors could improve their work. The project team then interviewed Federal agencies, local government representatives, and subject matter experts who have research experience in using wearable sensors. The goal was to identify best practices for public agencies and to understand the state of the practice. The list of interviewees is included in Appendix B. To better understand the current gaps in existing sensors and how wearable sensors could potentially improve their work, the project team members conducted interviews with FHWA researchers. They interviewed staff from the Office of Federal Lands Highway (FLH); Office of Planning, Environment, and Realty; and Office of Highway Policy Information. The interests of these FHWA researchers included major research applications for wearable sensors related to activity, location, health, and environmental conditions. FLH works to improve transportation on Federal and tribal lands, which are frequently in rural and remote locations and have a high share of unpaved roads. Unpaved roads produce large amounts of airborne dust, which create health and safety risks as a particulate pollutant. FLH is currently running a pilot dust control project in an Alaskan native community but faced high costs to transport and operate traditional fixed air monitors. FLH is interested in the use of wearable sensors as an alternative or supplement to traditional dust-monitoring methods, especially in locations where these methods are difficult and expensive. Wearable particu-late sensors available on the commercial market were not ready for use when this project began in the summer of 2015, but FLH remains interested. The Livability Team in the Office of Planning, Environment, and Realty is interested in collecting air quality and emissions data to support environmental justice, especially by working with community members and citizen scientists. Good data can be collected today with traditional sensors and methods, but this is usually costly, and coverage is poor. Wearable air quality sensors that are simple and inexpensive can be used to both expand sensor coverage and improve community engagement in environmental justice. The Office of Highway Policy Information specializes in highway data. Interests include the use of wearable sensors to detect and quantify active transportation, such as walking and cycling, without requiring manual traffic counts or trip diaries. These data can be used when modeling regional health or to create better bicycle and pedestrian travel models. To better understand the current use of wearable sensors in Federal agency research, the project team contacted representatives from the Environmental Protection Agency (EPA), Centers for Disease Control (CDC), and National Institutes of Health (NIH) to discuss their respective experiences and current activities. EPA's Office of Research and Development advances environmental science and has been working with wearable air quality sensors for several years. EPA scientists saw a flood of cheap sensors being used by members of the public. Enthusiasm was high, but sensors were inaccurate and methods for using the data were unsophisticated. EPA has since been working with sensor hardware manufacturers and citizen scientists to improve the quality of both hardware and research methods. EPA is helping lead the Exposure Science in the 21st Century Federal Working Group, which is coordinating more than 20 Federal agencies working together to promote the use of modern technologies and methods for environmental science. Study the use of portable and wearable sensors to monitor air pollution (shown in figure 1 and figure 2). Encourage the community use of sensors and data to help advocate for cleaner air. Develop different methods for working with data collected by novel air quality sensors. Compare new sensor technologies and practices against current methods. CDC's Epidemiology and Surveillance Team is one of several teams working on the agency's fight against obesity, which has been recognized as a major public health issue. One of their research topics is the use of accelerometers that quantify walking and cycling, a technique that is rapidly advancing thanks to the broad adoption of cheap, commercially available activity sensors. CDC and the Public Health Service participate in research—working with other Federal agencies, university researchers, and local governments—to make use of this data on both national and personal scales. Widespread use of sensors coupled with modeling makes broad surveillance of physical activity possible. Researchers and policymakers will be able to gauge the effectiveness of various public health campaigns and active transportation infrastructure improvements. On a smaller scale, wearable activity sensors can be a motivational tool to help people lose weight by encouraging them to walk, run, or bike more. NIH is the Nation's premier health research agency and has funded extensive research on the use of wearable sensors. NIH staff help advance wearable sensor research in many different health topics, including air quality and physical activity sensors of interest to transportation researchers. The agency's funding announce-ments draw considerable interest from academic researchers as well as from private companies and non-profits. The agency uses a variety of grant and contract mechanisms, including the Small Business Innovation Research program, for developing hardware and algorithms. NIH is taking a leading role in the Precision Medicine Initiative (PMI), a massive data-collection experiment that hopes to recruit a million participants. Data from wearable sensors are just some of the many types of data that will be collected from volunteers. The dataset will include genetic information, behavior samples, and wearable sensor data to inform prevention and treatment. PMI will begin by pulling participants from existing cohorts and importing data (donated by researchers and companies) that have already been collected. Using this dataset, researchers will be able to test correlations among physical activity and location, behavior, genetics, and other variables collected in an electronic health record. NIH is also using the experiment as a chance to test wearable sensors against each other and the validity of data collected from laboratory-grade sensors with commercial mass-produced devices. Kevin Patrick, University of California, San Diego. Francis Tsow, Arizona State University. Rochelle Carpenter, Nashville Area Metro-politan Planning Organization (MPO). Santosh Kumar, University of Memphis. Appendix B contains more information regarding the interviews. The researchers have a wide range of expertise across several sensors types. Lessons learned from these discussions are shared in the following section. The subject matter experts from local government and universities highlighted the following lessons during their discussions with the project team. Sensors are sufficiently mature for use in transportation research. Wearable sensors are generally small enough, efficient enough, and accurate enough for many transportation uses. Techniques and tools to analyze large volumes of data collected from wearable sensors are becoming more widespread. Wearable sensor research benefits from off-the-shelf technology. In addition to hosting their own range of sensors, the widespread diffusion of low-cost smartphones makes the use of dedicated wearable sensors far easier. As a result, an emerging best practice is to have a "dumb" wearable sensor collecting raw data (i.e., the sensor collects data but does not engage in processing tasks), which is then transmitted via low-power Bluetooth® to a study participant's tethered smartphone. Software installed on the connected phone can handle all data-collection and processing tasks and transmit the information back to the researcher for analysis. Research-grade wearable sensors are still expensive. A lack of demand means that few research-grade wearable sensors are mass-produced and commercially available, especially for air-quality monitoring. Many of the sensors used for research are custom orders or are assembled by the researchers themselves and can have cost, supply, and usability issues often associated with small-batch prototypes. Study participants are willing to help when research produces actionable results. Privacy and data access issues concern researchers and institutional review boards; however, volunteers typically are enthusiastic if they can be motivated by the potential benefits of the study. They are especially willing to participate in studies when the information produced is personally meaningful and something that they can use to make improvements in their daily lives. A single person cannot do much to change the air quality of his or her region, but if a person can see that his or her daily physical activity levels are low, then he or she may be encouraged to replace car trips with walking and biking. Transportation agencies are moving slowly in this area. The literature review and outreach revealed only one transportation agency that has used wearable sensors to collect data related to health and active transportation (see the Nashville Area MPO case study at the end of this section). Transportation agencies are just beginning to conduct their own wearable sensor studies or purchase data collected by others. Privacy issues make academic and Government use more difficult. Many personal datasets, particularly when location data is included, come with serious privacy concerns. Public sector researchers must carefully safeguard personally identifiable information, and academic researchers must face institutional review boards that are unaccustomed to large scale use of sensitive data. Monitoring exposure to exhaust from automobiles, especially nitrous oxide. Measuring volatile organic compounds to determine exposure rates and speciation of volatile organic compounds encountered by an individual throughout his or her day (figure 3). Monitoring exposure to particulates from exhaust, construction, dust, and other transportation sources (figure 4). Measuring exposure to noise pollution on a personal scale. Transportation agencies use environmental sensors for a wide variety of tasks, from regional monitoring and modeling of emissions to project-level construction monitoring and mitigation. Most of the limitations of the current environmental sensor technology have to do with their size and power efficiency. The most effective particulate sensors are bulky and may require active motors, which draw a lot of power. For example, sensors that are able to perform speciation require extra power and have lower resolution than those that only measure exposure. All of these limitations to traditional environmental sensors are usually carried over to wearable sensors as well. These problems have caused particulate sensors to lag behind other wearable sensors. Researchers in the field of hardware research and development are currently working on improving size, accuracy, and power efficiency. Wearable environmental sensors are relatively expensive because demand for them is low. There is not much consumer interest in wearable environmental sensors because the data collected are not actionable for the average person. For example, a reading of poor localized air quality in a study participant's neighborhood is certainly cause for alarm; however, there is not much that the average person can do to improve his or her localized air quality, beyond moving to another neighborhood or advocating to mitigate pollution from the source. Higher demand would encourage large-scale manufacturing, eventually bringing the cost down. Lower equipment costs would improve the ability of researchers to conduct field studies. Measuring levels of walking or cycling by using GPS and accelerometers on both the individual and the population scales. Estimating vehicle operators' stress levels by monitoring their cardiovascular, respiratory, and thermoregulatory systems and then associating moments of stress with a particular road segment or intersection by using GPS. Identifying pre-asthma attacks and other acute health crises that could affect a vehicle operator and monitoring the intake of medication. Estimating cardiovascular function by measuring the release of carbon dioxide, thereby assessing efficiency of respiration and exertion levels. Unlike environmental sensors, there has been considerable public interest in physiological sensors, with a particular interest in fitness sensors. Sensors that are commercially available and smartphone applications made by private companies—such as Strava, Fitbit, and Runkeeper—can track activity by using GPS and built-in accelerometers and estimate metabolic expenditure by using heart rate. Interest in losing weight and improving physical fitness has driven the popularity of these wearable sensors, amassing a wealth of activity- and health-related data for thousands of users. The use of smartphone technology in activity sensor suites takes advantage of the fact that smartphones are nearly ubiquitous and are powerful enough to handle much of the processing from an external sensor. Accelerometers are now ubiquitous in smartphones, and although they are less accurate than fitness bands, they enable every smartphone owner to track their own activity without purchasing dedicated hardware. A challenge lies in accessing these data because the device manufacturers maintain ownership, and most have, until recently, been hesitant to sell their raw data or processed analyses. In addition, these datasets are unlikely to capture the entire population, as the users are often early adopters who are educated, wealthy, and fitness or technology hobbyists. The wealth of information that these types of sensors are beginning to create is essentially a cross-section of its current users. Once this population of users is broad enough to represent the larger population, researchers will be able to develop individual-scale computational models based on statistical analysis of the whole dataset. New data collection is enabling large advances in the methods and tools used to analyze these new datasets. Study design and experimental regimens are also improving, but legal and ethical questions still remain. Several of these questions limit the research that can be performed by government and university researchers, many of whom are partnering with commercial and non-profit organizations that have more freedom to act. These questions are outlined in the following section. The large scale and fine fidelity of data collected by wearable sensors are a challenge to transportation agencies without data science expertise. Having robust data storage and analysis capabilities are essential to using some of the new datasets that are now available with wearable sensors. Costs are high but are declining as more people are trained in modern data-analysis methods. Privacy remains a major concern for many. Study participants' opinions about information-sharing may vary widely depending on demographics, immigration status, and other factors. An educated technology enthusiast may be willing to participate in a study that tracks his or her exposure to emissions along different walking routes, but an undocumented immigrant might be wary, especially if the research is conducted directly by a Government agency. In addition, these sensors are meant to be worn on the user's person, which may increase the sense of intrusiveness. Hacking of personal data is also a concern, particularly for health data. Privacy measures may compromise data management. Catering to privacy concerns may compromise the researchers' ability to manage the datasets effectively. For exam-ple, participants in the PMI will be able to select the types of data that they want to submit, providing a level of personal privacy. This means that the researchers will have to determine how to handle missing data points that are not randomized but are instead selected by individual participants. Existing systems of research ethics are not yet suited to working with data science and wearable sensors. Institutional review boards at universities struggle with aggregate data and permissions issues. Government research departments also struggle with ethical issues surrounding the data collected by wearable sensors. Many research frameworks were developed for traditional biomedical research, and researchers have not yet had time to answer the questions raised by the use of always-on sensors measuring very personal variables. Working with companies that collect data from wearable sensors may make issues with institutional research boards and consent irrelevant, assuming that companies have placed clear language in their terms of service. Some of the data already collected by companies may not be usable, because research purposes were not included in the terms of service. Companies tend to guard the data they collect from commercial wearable sensors carefully. A few now sell raw data or analyses to researchers, but many others have not yet been able to monetize their datasets. Even when data are available for sale, high prices can be out of reach for many smaller research projects. Many wearable sensor companies are hiring data scientists and other researchers to work internally with their own datasets and have released occasional samples or one-off studies. In addition, algorithms within commercial sensor applications that convert the accelerometer data to activities are propriety. Different companies use different assumptions and sensor hardware to collect the data; thus, raw data varies highly from one product to another. Leveraging smartphones simplifies research. The likelihood of proper use of a smartphone by study participants is higher than for a separate dedicated sensor because most people are used to handling them, carrying them at all times, and keeping them charged. One challenge related to this approach is the variation present among smartphone compatibility, operating systems, and hardware sensor differences. Developing for a wide range of smartphones and keeping an application up to date can be a challenge for a small research team. Multiple sensors improve data quality. A suite of sensors could be placed on various points of the body and connect wirelessly to a smartphone, allowing for the measurement of different physiological characteristics with only one device. Using multiple sensors improves data quality because the data from different sensors can be cross-checked and correlated with one another. For measuring activity and physiological response, single sensors worn at the wrist are fairly accurate; however, placing multiple sensors on different parts of the body (e.g., arm, chest, and leg) can capture different types of movement to enable the characterization of different types of activities (e.g., walking and bicycling). This is an important difference when using activity data to understand transportation mode and route choice. Commercial sensor calibration could reduce costs for transportation researchers. PMI, described earlier in this report, will collect location and activity data from the vast majority of participants, whereas a smaller cohort will be used to compare commercial- and research-grade wearable activity sensors for calibration purposes. The calibration of commercial wearable sensors would help transportation agencies who are interested in using this type of data to plan active transportation facilities, identify safety concerns for bicyclists and pedestrians, and understand which routes are most used by bicycles or pedestrians. Local governments have a strong interest in using wearable sensors to measure the effects of infrastructure and other improvements on transportation habits of their constituents. The Nashville Area MPO is leading the way among transportation agencies with respect to investigating the relationships between transportation planning and public health issues. One study in particular, the Middle Tennessee Transportation and Health Study, was sponsored by the Nashville Area MPO, the Clarksville Urbanized Area MPO, and the Tennessee Department of Transportation. The researchers used wearable sensors to connect transportation behaviors with health-related data. In 2012, as part of their household travel survey, the Nashville Area MPO instructed some participants to wear GPS devices and/or accelerometers to supplement the data collected from the survey. The travel survey also contained health-related questions along with the typical transportation questions. The Nashville Area MPO was able to determine how many people in the region use active transportation for some, or all, of their travel. The agency is analyzing the data with the aim of associating active transportation behaviors with health outcomes. The Nashville Area MPO is using a model called the Integrated Transport and Health Impact Modelling Tool to identify connections among health-related behavior, such as active transportation and health outcomes. This tool, which can estimate changes in 14 diseases associated with physical activity increases, has also been used by the San Francisco Metropolitan Transportation Commission in coordination with the California Department of Public Health, and by the Oregon Department of Transportation in coordination with the Oregon Health Authority. The limited use of this tool and others may be related to the difficulty and expense of collecting a broad dataset of active transportation behavior. The Nashville Area MPO found affordability to be a barrier to expanding their data collection beyond 6,000 households, which proved to be too small a sample size to answer some of the larger questions about the public health implications of active transportation. For more information about this and other health and transportation initiatives at the Nashville Area MPO, visit http://www.nashvillempo.org/regional_plan/health/. In summary, the project team found that wearable sensor technology is generally ready for a range of transportation applications. The devices are small, efficient, and accurate. Research-grade devices are fairly expensive, but commercial-grade sensors that take advantage of the power of smartphones can create a wealth of usable data that are becoming easier to obtain and analyze. Techniques and tools to analyze large volumes of data collected from wearable sensors are becoming more widespread, but data management is still an area that needs improvement. Although privacy can still be an issue in certain contexts and for specific populations, several of the subject matter experts interviewed for this project observed during their own research with wearable sensors that participants are willing to contribute their personal data if the results are understandable and actionable for them. These privacy concerns can be barriers for academic research because standard institutional review boards have not caught up with big data trends and are not unaccustomed to large-scale use of sensitive data. These limitations have caused transportation agencies to move slowly on using wearable sensors to complement their other data-collection efforts; however, the potential benefits are compelling, and more agencies are expected to adopt these methods in the future. Poor air quality is a growing global health concern that impacts millions of people worldwide. Although the scientific community is beginning to understand the health impacts of air pollution, it remains a challenge to provide people with the information they need to be able to make health-conscious choices. The CitiSense system gives individuals the real-time tools they need to identify when and where they are exposed to poor air. The authors present the results of a qualitative study regarding a 4-week "in the wild" deployment of the CitiSense air quality sensor and system. The authors focus on how the 16 participants in the study responded to their new-found information about their environment, how they shared information, and what kinds of actions were enabled by having access to real-time air quality data. Quantitative data gathered through the course of the study framed participant responses by showing what levels of pollution were experienced and what activities heightened exposure. The authors found that CitiSense's real-time graphical displays and everywhere-monitoring provided a critical bridge between data and experience, enabling sophisticated in-the-world sense-making and sharing with those nearby. This, in turn, affected behavior and attitudes, leading to shifts in how users reasoned about their world and how they assessed their personal choices and impact. The use of conventional tools of analysis for air quality has shown strong limitations in spatio-temporal coverage of urban scenarios. The required level of service needs a distributed approach, based on a dense network of mobile sensor nodes. Developments in sensor technologies and communications, together with constant social innovation, now make it possible for citizens to cooperate with each other, producing and socializing data for the simultaneous benefit of the individual and the community. The authors aim to develop this concept and apply it to the distributed monitoring of air quality. The goal is to enable individuals to monitor their exposure to air pollution while contributing to the construction of a map of the state of urban air quality through the sharing of data. Human exposure to specific environmental factors (e.g., air quality, lighting, and sound) is known to play an important role in the pathogenesis of many chronic diseases (e.g., asthma) and mental health disorders (e.g., anxiety). Conventional fixed environmental monitoring stations are, however, sparsely located and, despite environmental models, cannot adequately assess individual exposure levels. New forms of low-cost portable monitors have begun to emerge that enable the collection of higher spatial density "crowd sourced" data; however, the first generation of these low-cost environmental monitors has generally not been suitable for clinical environmental health studies due to practical challenges such as calibration, reproducibility, form factor, and battery life. The authors present a wearable environmental monitor that overcomes these challenges and can be used in clinical studies The new device, called "Eco-Mini," can be used without a smartphone and is capable of locally sampling and recording a variety of environmental parameters (ozone, sulfur dioxide, volatile organic compounds, humidity, temperature, ambient light color balance, and sound level) as well as individual activity (3-axis accelerometer) and location (Global Positioning System). The authors also report their findings and discuss lessons learned from a feasibility study conducted with pediatric patients for 1 week as part of an ongoing asthma research study. Air quality and pollution monitoring services are provided by many countries and cities. Individuals are, however, more concerned about personal exposure and dosage, which can rarely be estimated due to the low spatial resolution of air pollution data and lack of personal data. In recent years, an increasing number of research groups have focused on increasing the spatial resolution of air pollution data using ubiquitous sensor networks. These works did raise the spatial granularity compared with data from fixed air pollution monitoring sites. The authors combine air pollution and human energy expenditure data to give individuals real-time personal air pollution exposure estimates. In particular, the authors describe their experiences with developing a personal air pollution exposure estimation system utilizing participatory air pollution monitoring system and energy expenditure data collected from wearable activity sensors. Their system and applications will benefit the understanding of the relationship between air pollution exposure and personal health. The authors also conducted a trial to get a full day of air pollution inhalation dosage data for one participant, and applied multiple data-mining techniques to find associations between activity mode, location, and the inhaled pollution. Results show that sleep, having meals, working in a campus, and general home activities like reading books will lead to a low air pollution dosage, although working out, walking, and driving will cause a higher inhaled dose. Furthermore, classification results in the study based on activity modes, locations, and dosage data, which are collected in the trial, show that up to 94 percent classification accuracy can be achieved. The authors provide wearable pieces of apparatus for monitoring various physiological and environmental factors. Real-time, noninvasive health and environmental monitors include a plurality of compact sensors integrated within small, low-profile devices, such as earpiece modules. Physiological and environmental data are collected and wirelessly transmitted into a wireless network, where the data are stored and/or processed. There is growing market demand for personal health and environmental monitors (e.g., for gauging overall health and metabolism during exercise, athletic training, dieting, and physical therapy). Traditional health monitors and environmental monitors, however, may be bulky, rigid, and uncomfortable—generally not suitable for use during daily physical activity. There is also growing interest in generating and comparing the health and environmental exposure statistics of the general public and particular demographic groups. For example, collective statistics enable the healthcare industry and medical community to direct healthcare resources to where they are most highly valued; however, methods of collecting these statistics may be expensive and laborious, often utilizing human-based recording/analysis steps at multiple sites. As such, improved ways of collecting, storing, and analyzing personal health and environmental information are needed. In addition, improved ways of distributing raw and analyzed personal health and environmental information are desirable to support efforts to enhance healthcare quality and reduce costs. Personal exposure studies of air pollution generally use self-reported diaries to capture individuals' time–activity data. Enhancements in the accuracy, size, memory, and battery life of personal Global Positioning Systems (GPS) units have allowed for higher resolution tracking of study participants' locations. Improved time–activity classifications combined with personal continuous air pollution sampling can improve assessments of location-related air pollution exposures for health studies. Data were collected using GPS and the personal temperatures from 54 children with asthma living in Montreal, Canada, who participated in a 10-day personal air pollution exposure study. A method was developed that incorporated personal temperature data and then matched a participant's position against available spatial data (i.e., road networks) to generate time–activity categories. The diary-based and GPS-generated time–activity categories were compared and combined with continuous personal PM2.5 data to assess the impact of exposure misclassification when using diary-based methods. There was good agreement between the automated method and the diary method; however, the automated method (means: outdoors = 5.1 percent, indoors other = 9.8 percent) estimated less time spent in some locations compared to the diary method (outdoors = 6.7 percent, indoors other = 14.4 percent). Agreement statistics (AC1 = 0.778) suggest "good" agreement between methods over all location categories. Location categories ("outdoors and transit"), however, where less time is spent, show greater disagreement (e.g., mean time "indoors other"): using the time–activity diary was 14.4 percent compared to 9.8 percent using the automated method. Although mean daily time "in transit" was relatively consistent between the methods, the mean daily exposure to PM2.5 while "in transit" was 15.9 µg/m3 using the automated method compared to 6.8 µg/m3 using the daily diary. Mean times spent in different locations as categorized by a GPS-based method were comparable to those from a time–activity diary, but there were differences in estimates of exposure to PM2.5 from the two methods. An automated GPS-based time–activity method will reduce participant burden, potentially providing more accurate and unbiased assessments of location. Combined with continuous air measurements, the higher resolution GPS data could present a different and more accurate picture of personal exposures to air pollution. Occupational Heat Stress (OHS) happens when a worker is physically active in hot environments. OHS can produce a strain on the body that leads to discomfort and, eventually, to heat illness and even death. Related International Organization for Standardization (ISO) standards contain methods to estimate OHS and to ensure the safety and health of workers, but they are subjective, impersonal, performed a posteriori, and are even invasive. The authors hypothesize that a real-time automated method is more effective and objective for estimating OHS if it fuses data from environmental sensors and unobtrusive physiological body sensors, and takes into account the user profile. The authors propose a personalized method based on ergonomic calculations to offer a solution. They found that this method allows for estimating the personalized effort levels, energy expenditure, and drudgery of work for each worker and enables the user to make informed decisions to control OHS. The authors believe that ISO standards could consider technological advances to propose real-time personalized methods of estimating OHS. Advances in embedded systems and low-cost gas sensors are enabling a new wave of low-cost air quality monitoring tools. The authors have been engaged in the development of low-cost wearable air quality monitors (M-Pods) using the Arduino platform. The M-Pods use commercially available metal oxide semiconductor (MOS) sensors to measure CO, O3, NO2, and total volatile organic compounds, and uses nondisperive infrared sensors to measure CO2. MOS sensors are low in cost and show high sensitivity near ambient levels; however, they display nonlinear output signals and have cross-sensitivity effects. Thus, a quantification system was developed to convert the MOS sensor signals into concentrations. 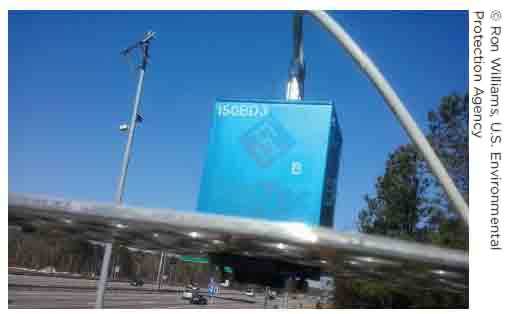 Two deployments were conducted at a regulatory monitoring station in Denver, CO. M-Pod concentrations were determined using laboratory calibration techniques and co-location calibrations, in which the authors placed the M-Pods near regulatory monitors to then derive calibration function coefficients using the regulatory monitors as the standard. The form of the calibration function was derived based on laboratory experiments. The authors discuss the various techniques used to estimate measurement uncertainties. A separate user study was also conducted to assess personal exposure and M-Pod reliability. In this study, 10 M-Pods were calibrated via co-location multiple times over 4 weeks and sensor drift was analyzed, with the result being a calibration function that included drift. The authors found that co-location calibrations perform better than laboratory calibrations. Laboratory calibrations suffer from bias and difficulty in covering the necessary parameter space. During co-location calibrations, median standard errors ranged between 4.0–6.1 ppb for O3, 6.4–8.4 ppb for NO2, 0.28–0.44 ppm for CO, and 16.8 ppm for CO2. Median signal-to-noise ratios for the M-Pod sensors were higher for M-Pods than for the regulatory instruments: for NO2, 3.6 compared to 23.4; for O3, 1.4 compared to 1.6; for CO, 1.1 compared to 10.0; and for CO2, 42.2 compared to 300–500.The user study provided trends and location-specific information on pollutants and affected change in user behavior. The authors demonstrated the utility of the M-Pod as a tool to assess personal exposure. The degree of pollution in the atmosphere is increasing, leading to more and more people being affected by breathing health issues. People are, however, becoming increasingly aware of the need to monitor their environment. The authors propose a platform that leverages a wearable sensor device and mobile devices to collect large amounts of air quality data on a central real-time data-processing system that can process all this information, aggregate it, and disseminate it back to the users in a relevant way. The authors designed and developed wearable sensor devices that are capable of measuring CO2, NO, and particulate matter. They also designed and developed a mobile application that pulls data from the sensor device in an energy-friendly way, as described by their adaptive query algorithm, and pushes it in the central processing system. The authors present a real-time processing platform for wireless sensor networks that satisfies the characteristics of scalability, fault tolerance, and real-time processing needed to serve as their central processing system. Adverse health effects from exposure to air pollution present a global challenge and are of widespread concern. Recent high ambient concentration episodes of air pollutants in European cities highlighted the dynamic nature of human exposure and the gaps in data and knowledge about exposure patterns. In order to support a health-impact assessment it is essential to develop a better understanding of individual exposure pathways in people's everyday lives by taking account of all environments in which people spend time. Here the authors describe the development, validation, and results of an exposure method applied in a study conducted in Scotland. A low-cost particle counter based on light-scattering technology—the Dylos 1700—was used. Its performance was validated in comparison with equivalent instruments (TEOM/FDMS) at two national monitoring network sites (R2 = 0.9 at a rural background site, R2 = 0.7 at an urban background site). This validation also provided two functions to convert measured particle number concentrations (PNCs) into calculated particle mass concentrations for direct comparison of concentrations with equivalent monitoring instruments and air quality limit values. This study also used contextual and time-based activity data to define six microenvironments (MEs) to assess everyday exposure of individuals to short-term PM2.5 concentrations. The Dylos was combined with a Global Positioning System receiver to track movement and exposure of individuals across the MEs. Seventeen volunteers collected 35 profiles. Profiles may have a different overall duration and structure with respect to times spent in different MEs and activities undertaken. Results indicate that, due to the substantial variability across and between MEs, it is essential to measure near-complete exposure pathways to allow for a comprehensive assessment of the exposure risk that a person encounters on a daily basis. Taking into account the information gained through personal exposure measurements, this work demonstrates the added value of data generated by the application of low-cost monitors. A prolonged exposure to stress can lead to mental disorders and psychosomatic diseases (e.g., declining of health). In this survey, the authors review sensors, human body parameters, and context information correlated with stress level, and investigate various stress analysis methods. Sensors for stress determination are classified and divided into four groups with regard to the physiological and physical parameters of the human body, context information, expert assessment, and questionnaires. Future work to be done in the field of stress recognition is also discussed. Traditionally, air pollution is measured by expensive, stationary, and complex air-monitoring instrumentation. Only a few organizations, like federal and State governments and some industries, typically collect data of such high quality. Even so, this limits the amount of environmental monitoring data that are often available for exposure and health assessments. As air quality management problems become more complex, there is a need for enhanced air quality and exposure monitoring capabilities. The aim of the authors is to present the concept of a temperature measurement system adapted to wearable electronics applications. Temperature is one of the most commonly monitored factors in smart textiles, especially in sportswear, medical, and rescue products. Depending on the application, measured temperature could be used as an initial value of alert, heating, lifesaving, or analysis systems. The authors elaborate on the concept of the temperature measurement multipoint system, which consists of flexible, screen-printed resistive sensors placed on a T-shirt connected with the central unit and the power supply. Traditional air quality monitoring networks are the foundation for air quality management, policy and regulations, population exposure assessments, and health effects research. With increasing awareness of spatial variability in air pollution concentrations within cities and the importance of pollution gradients from traffic and neighborhood sources, such as residential wood combustion, there is an increasing need to also evaluate air pollution variability at local or neighborhood scales. Although passive sampler networks, mobile monitoring campaigns, and the application of land use regression and dispersion models have provided useful information on air pollution spatial variability, none of the approaches can fully characterize both short-term temporal and spatial gradients in pollutant concentrations. Recently, there has been a proliferation of low-cost, low-power, miniaturized, autonomous (and typically wireless) air quality monitoring units that have the potential to be applied in dynamic dispersed high-resolution air quality monitoring networks and to be used in "Citizen Science" applications. In this report, the authors review new air quality monitoring technologies and discuss their use in the context of conventional monitoring and new applications. The authors summarize information on sensor performance and provide recommendations regarding future applications. The authors provide the latest advances from the National Science Foundation's Advanced Self-powered Systems of Integrated Sensors and Technologies (ASSIST) center. The work in the center addresses the key challenges in wearable health and environmental systems by exploring technologies that enable ultra-long battery lifetime, user comfort and wearability, robust medically validated sensor data with value added from multimodal sensing, and access to open architecture data streams. The vision of the ASSIST center is to use nanotechnology to build miniature, self-powered, wearable, and wireless sensing devices that can enable monitoring of personal health and personal environmental exposure and enable correlation of multimodal sensors. These devices can empower patients and doctors to transition from managing illness to managing wellness and create a paradigm shift in improving healthcare outcomes. The authors present the latest advances in high-efficiency nanostructured energy harvesters and storage capacitors; new sensing modalities that consume less power; low-power computation and communication strategies; and novel flexible materials that provide form, function, and comfort. These technologies span a spatial scale ranging from underlying materials at the nano scale to body-worn structures, and the challenge is to integrate them into a unified device designed to revolutionize wearable health applications. Wearable technologies for automotive user interfaces: Danger or opportunity? Wearable technologies are spreading into the everyday lives of human beings. Smart bracelets, watches, and glasses promise to provide us with ready-at-hand access to several information and interaction possibilities. What happens when these technologies enter the car? Are they a mere danger or can they also offer information and interaction opportunities that can improve the vehicle inhabitants' user experience and safety? The authors aim to discuss all the opportunities and dangers that such technologies not only are already bringing to current vehicles but could also bring to future semiautonomous and autonomous vehicles. Advances in mobile and wearable devices are making it feasible to deploy sensing systems at a large-scale. Slower progress is being made, however, in activity recognition, which remains often unreliable in everyday environments. The authors investigate how to leverage the increasing capacity to gather data at a population-scale toward improving existing models of human behavior. The authors specifically consider the various social phenomena and environmental factors that cause people to develop correlated behavioral patterns, especially within communities connected by strong social ties. Reasons underpinning correlated behavior include shared externalities (e.g., work schedules, weather, traffic conditions), which shape options and decisions; and cases of adopted behavior, as people learn from each other or assume group norms due to social pressure. Most existing approaches to modeling human behavior ignore all of these phenomena and recognize activities solely on the basis of sensor data captured from a single individual. The authors propose the Networked Community Behavior (NCB) framework for activity recognition, specifically designed to exploit community-scale behavioral patterns. Under NCB, patterns of community behavior are mined to identify social ties that can signal correlated behavior; this information is used to augment sensor-based inferences available from the actions of individuals. The authors' evaluation of NCB shows it is able to outperform existing approaches to behavior modeling across four mobile sensing datasets that collectively require a diverse set of activities to be recognized. The authors present a recognition scheme for fine-grain gestures. The scheme leverages a directional antenna and short-range wireless propagation properties to recognize a vocabulary of action-oriented gestures from American Sign Language. Because the scheme only relies on commonly available wireless features such as Received Signal Strength (RSS), signal phase differences, and frequency sub-band selection, it is readily deployable on commercial off-the-shelf IEEE 802.11 devices. The authors have implemented the proposed scheme and evaluated it in two potential application scenarios: gesture-based electronic activation from a wheelchair and gesture-based control of a car infotainment system. The results show that the proposed scheme can correctly identify and classify up to 25 fine-grain gestures with an average accuracy of 92 percent for the first application scenario and 84 percent for the second scenario. The authors propose a novel system for estimating crowd density and smoothness of pedestrian flows in public space by participatory sensing with mobile phones. By analyzing the walking motion of pedestrians and ambient sound in the environment that can be monitored by accelerometers and microphones in off-the-shelf smartphones, their system classifies the current situation at each area into four categories that well-represent the crowd behavior. 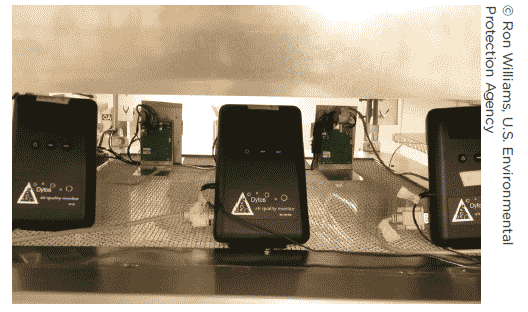 Through field experiments using Android smartphones, the authors show that their system can recognize the current situation with accuracy of 60—78 percent. Designing a wearable driver-assist system requires extraction of relevant features from physiological signals, such as galvanic skin response and photoplethysmograms collected from automotive drivers during real-time driving. In the discussed case, four stress classes were identified using a cascade-forward neural network (CASFNN), which performed consistently with minimal intra- and inter-subject variability. Task-induced stress trends were tracked using a Trigg's Tracking Variable-based regression model with CASFNN configuration. The proposed framework will enable proactive initiation of rescue and relaxation procedures during accidents and emergencies. Motion analysis technologies have been widely used to monitor the potential for injury and enhance athlete performance. Most of these technologies, however, are expensive, can only be used in laboratory environments, and examine only a few trials of each movement action. The authors present a novel ambulatory motion analysis framework using wearable inertial sensors to accurately assess all of an athlete's activities in an outdoor training environment. The authors first present a system that automatically classifies a large range of training activities using the discrete wavelet transform in conjunction with a random forest classifier. The classifier is capable of successfully classifying various activities with up to 98 percent accuracy. Second, a computationally efficient gradient descent algorithm is used to estimate the relative orientations of the wearable inertial sensors mounted on the thigh and shank of a subject, from which the flexion–extension knee angle is calculated. Finally, a curve shift registration technique is applied to both generate normative data and determine if a subject's movement technique differed to the normative data in order to identify potential injury-related factors. It is envisaged that the proposed framework could be utilized for accurate and automatic sports activity classification and reliable movement technique evaluation in various unconstrained environments. Wearable sensors have garnered considerable recent interest owing to their tremendous promise for a plethora of applications; yet the absence of reliable noninvasive chemical sensors has greatly hindered progress in the area of on-body sensing. Electrochemical sensors offer considerable promise as wearable chemical sensors that are suitable for diverse applications owing to their high performance, inherent miniaturization, and low cost. A wide range of wearable electrochemical sensors and biosensors has been developed for real-time, noninvasive monitoring of electrolytes and metabolites in sweat, tears, or saliva as indicators of a wearer's health status. With continued innovation and attention to key challenges, such noninvasive electrochemical sensors and biosensors are expected to open up new exciting avenues in the field of wearable wireless sensing devices and body-sensor networks, and thus find considerable use in a wide range of personal healthcare monitoring applications, as well as in sport and military applications. Technological advances on the development of mobile devices, medical sensors, and wireless communication systems support a new generation of unobtrusive, portable, and ubiquitous health-monitoring systems for continuous patient assessment and more personalized health care. There exists a growing number of mobile apps in the health domain; however, little contribution has been specifically provided so far to operate these kinds of apps with wearable physiological sensors. The PhysioDroid presented in this paper provides a personalized means to remotely monitor and evaluate users' conditions. The PhysioDroid system provides ubiquitous and continuous vital signs analysis, such as electrocardiogram, heart rate, respiration rate, skin temperature, and body motion, intended to help empower patients and improve clinical understanding. The PhysioDroid is composed of a wearable monitoring device and an Android app that provides gathering, storage, and processing features for the physiological sensor data. The versatility of the developed app allows its use for both average users and specialists, and the reduced cost of the PhysioDroid puts it at the reach of most people. Two exemplary use cases for health assessment and sports training are presented to illustrate the capabilities of the PhysioDroid. Next technical steps include generalization to other mobile platforms and health monitoring devices. Wearable computing devices can greatly enhance the quality of life, aiding interaction with smart environments, activity recognition, and healthcare applications. Smart garments offer the opportunity to integrate sensors and electronics in unobtrusive wearable systems. The authors present a case study of an embedded hand-gesture–recognition system, which uses electromyography electrodes embeddable in smart clothes. The authors analyze the main challenges of a real-time system for pattern recognition, and the results of the proposed experiment demonstrate the feasibility of a real-time system for pattern recognition, which can be integrated in smart clothes. Despite the known advantages of objective physical activity monitors (e.g., accelerometers), these devices have high rates of nonwear, which lead to missing data. Objective activity monitors are also unable to capture valuable contextual information about behavior. Adolescents recruited into physical activity surveillance and intervention studies will increasingly have smartphones, which are miniature computers with built-in motion sensors. The authors describe the design and development of a smartphone application ("app") called Mobile Teen that combines objective and self-report assessment strategies through (1) sensor-informed context-sensitive ecological momentary assessment (CS-EMA) and (2) sensor-assisted end-of-day recall. The Mobile Teen app uses the smartphone's built-in motion sensor to automatically detect likely bouts of phone nonwear, sedentary behavior, and physical activity. The app then uses transitions between these inferred states to trigger CS-EMA self-report surveys measuring the type, purpose, and context of activity in real-time. The end-of-day recall component of the Mobile Teen app allows users to interactively review and label their own physical activity data each evening using visual cues from automatically detected major activity transitions from the phone's built-in motion sensors. Major activity transitions are identified by the app, which cues the user to label that "chunk," or period, of time using activity categories. Sensor-driven CS-EMA and end-of-day recall smartphone apps can be used to augment physical activity data collected by objective activity monitors, filling in gaps during nonwear bouts and providing additional real-time data on environmental, social, and emotional correlates of behavior. Smartphone apps such as these have potential for affordable deployment in large-scale epidemiological and intervention studies. Body sensor networks (BSNs) have emerged as the most effective technology that enables not only new e-Health methods and systems but also novel applications in human-centered areas such as electronic health care, fitness/wellness systems, sport performance monitoring, interactive games, factory worker monitoring, and social–physical interaction. Despite their enormous potential, they are currently mostly used only to monitor single individuals. Indeed, BSNs can proactively interact and collaborate to foster novel BSN applications centered on collaborative groups of individuals. In this paper, C-SPINE, a framework for collaborative BSNs (CBSNs), is proposed. CBSNs are BSNs able to collaborate with each other to fulfill a common goal. They can support the development of novel smart wearable systems for cyberphysical pervasive computing environments. Collaboration, therefore, relies on interaction and synchronization among the CBSNs and on collaborative distributed computing atop the collaborating CBSNs. Specifically, collaboration is triggered upon CBSN proximity and relies on service-specific protocols allowing for managing services among the collaborating CBSNs. C-SPINE also natively supports multisensor data fusion among CBSNs to enable joint data analysis such as filtering, time-dependent data integration, and classification. To demonstrate its effectiveness, C-SPINE is used to implement e-Shake, a collaborative CBSN system for the detection of emotions. The system is based on a multisensor data fusion schema to perform automatic detection of handshakes between two individuals and capture of possible heart-rate–based emotional reactions due to the individuals' meeting. Nonobtrusive options for monitoring the wrist and hand movement are needed for stroke rehabilitation and other applications. The authors describe the "manumeter," a device that logs total angular distance travelled by wrist and finger joints using a magnetic ring worn on the index finger and two triaxial magnetometers mounted in a watch-like unit. The authors describe an approach to estimate the wrist and finger joint angles using a radial basis function network that maps differential magnetometer readings to joint angles. They tested this approach by comparing manumeter estimates of total angular excursion with those from a passive goniometric exoskeleton worn simultaneously as seven participants completed a set of 12 manual tasks at low-, medium-, and high-intensity conditions on a first testing day, 1–2 days later, and 6–8 days later, using only the original calibration from the first testing day. Manumeter estimates scaled proportionally to the intensity of hand activity. Estimates of angular excursion made with the manumeter were 92.5 percent ± 28.4 (standard deviation), 98.3 percent ± 23.3, and 94.7 percent ± 19.3 of the goniometric exoskeleton across the three testing days, respectively. Magnetic sensing of wrist and finger movement is nonobtrusive and can quantify the amount of use of the hand across days. Garment-integrated sensors equip clothes with a smart-sensing capability while preserving the comfort of the user. This benefit can, however, be to the detriment of sensing accuracy due to the unpredictability of garment movement (which affects sensor positioning) and textile folds (which can affect sensor orientation). Sensors integrated directly into garments or fabric structures can also be used to detect the movement of the garment during wearing. In particular, a textile-bend sensor could be used to sense folds in the garment. The authors tested a garment-integrated stitched sensor for five types of folds, stitched on five different weights of unstretchable denim fabric, and analyzed the effects of fold complexity and fabric stiffness under uninsulated and insulated conditions. Results show that insulation improves the linearity and repeatability of the sensor response, particularly for higher fold complexity. Stiffer fabrics show greater sensitivity, but less linearity. Sensor response amplitude is larger for more complex fold geometries. The authors discuss the utility of a linear bending response (insulated) and a binary shorting response (uninsulated). Overall, the sensor exhibits excellent repeatability and accuracy, particularly for a fiber-based, textile-integrated sensor. The authors introduce a novel physiological sensor, which combines electrical and mechanical modalities in a co-located arrangement, to reject motion-induced artifacts. The mechanically sensitive element consists of an electret condenser microphone containing a light diaphragm, allowing it to detect local mechanical displacements and disregard large-scale whole-body movements. The electrically sensitive element comprises a highly flexible membrane, conductive on one side and insulating on the other. It covers the sound hole of the microphone, thereby forming an isolated pocket of air between the membrane and the diaphragm. The co-located arrangement of the modalities allows the microphone to sense mechanical disturbances directly through the electrode, thus providing an accurate proxy to artifacts caused by relative motion between the skin and the electrode. This proxy is used to reject such artifacts in the electrical physiological signals, enabling enhanced recording quality in wearable health applications. The authors describe the analysis and design of a wearable technology garment intended to aid with the instruction of ballet technique to adult beginners. A phenomenological framework is developed and used to assess physiological training tools. Following this, a garment is developed that incorporates visual feedback inspired by animation techniques that more directly convey the essential movements of ballet. The authors present the garment design and a discussion is provided on the challenges of constructing an e-textile garment using contemporary materials and techniques. Locations and actions are interrelated: some activities tend to occur at specific places. For example, a person is more likely to twist his wrist when he is close to a door (to turn the knob). The authors present an unsupervised fusion method that takes advantage of this characteristic to enhance the recognition of location-related actions (e.g., open, close, switch, etc.). The proposed LocAFusion algorithm acts as a post-processing filter: At run-time, it constructs a semantic map of the environment by tagging action recognitions to Cartesian coordinates. It then uses the accumulated information about a location to (1) discriminate between identical actions performed at different places and (2) correct recognitions that are unlikely, given the other observations at the same location. LocAFusion does not require prior statistics about where activities occur, which allows for seamless deployment to new environments. The fusion approach is agnostic to the sensor modalities and methods used for action recognition and localization. For evaluation, the authors implemented a fully wearable setup that tracks the user with a foot-mounted motion sensor and the ActionSLAM algorithm. At the same time, the authors recognize hand actions through template matching on the data of a wrist-worn inertial measurement unit. In 10 recordings with 554 performed object interactions, LocAFusion consistently outperformed location-independent action recognition (8 percent to 31 percent increase in F1 score), identified 96 percent of the objects in the semantic map, and overall correctly labeled 82 percent of the actions in problems with up to 23 classes. Building affect-driven adaptive environments is a task geared toward creating environments able to change based on the affective state of a target user. In this project, the environment is the well-known game, Pac-Man. To provide affect-driven adaptive capabilities, the authors utilized diverse sensors to gather a user's physiological data, and an emotion recognition framework was used to fuse the sensed data and infer affective states. The game-changes driven by those affective states aim to improve the user experience by keeping or increasing player's engagement. The recent emergence of comfortable wearable sensors has focused almost entirely on monitoring physical activity, ignoring opportunities to monitor more subtle phenomena, such as the quality of social interactions. The authors argue that it is compelling to address whether physiological sensors can shed light on the quality of social interactive behavior. This work leverages the use of a wearable electrodermal activity (EDA) sensor to recognize ease of engagement of children during a social interaction with an adult. In particular, the authors monitored 51 child–adult dyads in a semistructured play interaction and used support vector machines to automatically identify children who had been rated by the adult as more or less difficult to engage. The authors report on the classification value of several features extracted from each child's EDA responses, as well as several other features that capture the physiological synchrony between the child and the adult. With recent advances in microprocessor chip technology, wireless communication, and biomedical engineering, it is possible to develop miniaturized ubiquitous health monitoring devices that are capable of recording physiological and movement signals during daily life activities. The aim of this research is to implement and test the prototype of a health monitoring system. The system consists of the body central unit with a Bluetooth® module and wearable sensors, the custom-designed electrocardiogram sensor, the temperature sensor, the skin humidity sensor and accelerometers placed on the human body or integrated with clothes, and a network gateway to forward data to a remote medical server. The system includes a custom-designed transmission protocol and remote Web-based graphical user interface for remote real- time data analysis. Experimental results for a group of humans who performed various activities (e.g., working, running, etc.) showed maximum 5 percent absolute error compared to certified medical devices. The results are promising and indicate that a developed wireless wearable monitoring system faces challenges of multisensor human health monitoring while performing daily activities and opens new opportunities in developing novel healthcare services. The explosion of technologic advances in information capture and delivery offer unparalleled opportunities to assess and modify built and social environments in ways that can positively impact health behaviors. This paper highlights some potentially transformative current and emerging trends in the technology arena that are applicable to environmental context-based assessment and intervention relevant to physical activity and dietary behaviors. A team of experts convened in 2013 to discuss the main issues related to technology-use in assessing and changing built environments for health behaviors, particularly those relevant to obesity prevention. Each expert was assigned a specific domain to describe, commensurate with his or her research and expertise in the field, along with examples of specific applications. This activity was accompanied by selective examination of published literature to cover the main issues and elucidate relevant applications of technologic tools and innovations in this field. Decisions concerning which technology examples to highlight were reached through discussion and consensus-building among the team of experts. Two levels of impact are highlighted: the "me" domain, which primarily targets measurement and intervention activities aimed at individual-level behaviors and their surrounding environments; and the "we" domain, which generally focuses on aggregated data aimed at groups and larger population segments and locales. The authors conclude the paper with a set of challenges and opportunities for significantly advancing the field. Key areas for progress include data collection and expansion, managing technologic considerations, and working across sectors to maximize the population potential of behavioral health technologies. Exposures to ultrafine particles (<100 nm, estimated as particle number concentration (PNC)) differ from ambient concentrations because of the spatial and temporal variability of both PNC and people. The goal of this research was to evaluate the influence of time–activity adjustment on exposure assignment and associations with blood biomarkers for a near-highway population. A regression model based on mobile monitoring and spatial and temporal variables was used to generate hourly ambient residential PNC for a full year for a subset of participants (n=140) in the Community Assessment of Freeway Exposure and Health study. The authors modified the ambient estimates for each hour using personal estimates of hourly time spent in five microenvironments (inside home, outside home, at work, commuting, other) as well as particle infiltration. Time–activity adjusted (TAA)-PNC values differed from residential ambient annual average (RAA)-PNC, with lower exposures predicted for participants who spent more time away from home. Employment status and distance to highway had a differential effect on TAA-PNC. The authors found associations of RAA-PNC with high sensitivity C-reactive protein and interleukin-6, although exposure–response functions were nonmonotonic. TAA-PNC associations had larger effect estimates and linear exposure–response functions. The authors' findings suggest that time–activity adjustment improves exposure assessment for air pollutants that vary greatly in space and time. An increase in world population, along with a significant aging portion, is forcing rapid rises in healthcare costs. The healthcare system is going through a transformation in which continuous monitoring of inhabitants is possible even without hospitalization. The advancement of sensing technologies, embedded systems, wireless communication technologies, nanotechnologies, and miniaturization makes it possible to develop smart systems to monitor activities of human beings continuously. Wearable sensors detect abnormal and/or unforeseen situations by monitoring physiological parameters along with other symptoms; therefore, necessary help can be provided in times of dire need. The author reviews the latest reported systems on activity monitoring of humans based on wearable sensors and issues to be addressed to tackle the challenges. The authors present wearable dry electrodes made of silver nanowires for electrophysiological sensing, such as electrocardiography and electromyography. The dry electrodes perform as well as the Ag/AgCl wet electrodes when the subject is resting and show fewer motion artifacts, but without the electrolytic gel. The nanowire electrodes show no signs of skin irritation, which is desirable for long-term health monitoring. Stress can lead to headaches and fatigue, precipitate addictive behaviors (e.g., smoking, alcohol and drug use), and lead to cardiovascular diseases and cancer. Continuous assessment of stress from sensors can be used for timely delivery of a variety of interventions to reduce or avoid stress. The authors investigate the feasibility of continuous stress measurement via two field studies using wireless physiological sensors—a 4-week study with illicit drug users (n = 40), and a 1-week study with daily smokers and social drinkers (n = 30). The authors find that 11+ hours/day of usable data can be obtained in a 4-week study. Significant learning effect is observed after the first week and data yield is seen to be increasing over time even in the fourth week. The authors propose a framework to analyze sensor data yield and find that losses in wireless channel are negligible; the main hurdle in further improving data yield is the attachment constraint. The authors show the feasibility of measuring stress minutes preceding events of interest and observe the sensor-derived stress to be rising prior to self-reported stress and smoking events. Integrating rehabilitation services through wearable systems has the potential to accurately assess the type, intensity, duration, and quality of movement necessary for procuring key outcome measures. The authors aim to explore wearable accelerometry-based technology (ABT) capable of assessing mobility-related functional activities intended for rehabilitation purposes in community settings for neurological populations. In this review, the authors focus on the accuracy of ABT-based methods, types of outcome measures, and the implementation of ABT in nonclinical settings for rehabilitation purposes. The search strategy covered three main areas, namely wearable technology, rehabilitation, and setting. Potentially relevant studies were categorized as systems that either evaluate methods or outcome parameters. Methodological qualities of the studies were assessed by two customized checklists, depending on their categorization, and rated independently by three blinded reviewers. Twelve studies involving ABT met the eligibility criteria, of which three studies were identified as having implemented ABT for rehabilitation purposes in nonclinical settings. From the twelve studies, seven studies achieved high methodological quality scores. These studies were not only capable of assessing the type, quantity, and quality measures of functional activities, but could also distinguish healthy from nonhealthy subjects and/or address disease severity levels. Although many studies support ABT's potential for telerehabilitation, few actually utilized it to assess mobility-related functional activities outside laboratory settings. To generate more appropriate outcome measures, there is a clear need to translate research findings and novel methods into practice. Fitting sensors to humans and physical structures is becoming more and more common. These developments provide many opportunities for ubiquitous computing, as well as challenges for analyzing the resulting sensor data. From these challenges, an underappreciated problem arises: modeling multivariate time series with mixed sampling rates. Although mentioned in several application papers using sensor systems, this problem has been left almost unexplored, often hidden in a preprocessing step or solved manually as a one-pass procedure (feature extraction/construction). This leaves an opportunity to formalize and develop methods that address mixed sampling rates in an automatic fashion. The authors approach the problem of dealing with multiple sampling rates from an aggregation perspective. They propose Accordion, a new embedded method that constructs and selects aggregate features iteratively, in a memory-conscious fashion. Their algorithms work on both classification and regression problems. The authors describe three experiments on real-world time series datasets, with satisfying results. The authors propose a graph-based, low-complexity sensor fusion approach for ubiquitous pedestrian indoor positioning using mobile devices. The authors employ their fusion technique to combine relative motion information based on step detection with WiFi signal-strength measurements. The method is based on the well-known particle filter methodology. In contrast to previous work, the authors provide a probabilistic model for location estimation that is formulated directly on a fully discretized, graph-based representation of the indoor environment. They generate this graph by adaptive quantization of the indoor space, removing irrelevant degrees of freedom from the estimation problem. The authors evaluate the proposed method in two realistic indoor environments using real data collected from smartphones. In total, the dataset spans about 20 km in distance walked and includes 13 users and four different mobile device types. The results demonstrate that the filter requires an order of magnitude less particles than state-of-the-art approaches, while maintaining an accuracy of a few meters. The proposed low-complexity solution not only enables indoor positioning on less-powerful mobile devices, but also saves much-needed resources for location-based end-user applications, which run on top of a localization service. The authors present a novel sensing modality for hands-free gesture-controlled user interfaces, based on active capacitive sensing. Four capacitive electrodes are integrated into a textile neckband, allowing continuous unobtrusive head movement monitoring. The authors explore the capability of the proposed system for recognizing head gestures and postures. A study involving 12 subjects was carried out, recording data from 15 head gestures and 19 different postures. The authors present a quantitative evaluation based on this dataset, achieving an overall accuracy of 79.1 percent for head gesture recognition and 40.4 percent for distinguishing between head postures (69.9 percent when merging the most adjacent positions), respectively. These results indicate that this approach is promising for hands-free control interfaces. An example application scenario of this technology is the control of an electric wheelchair for people with motor impairments, where recognized gestures or postures can be mapped to control commands. The authors present their vision for the semantic management of moving objects. They argue that exploiting semantic techniques in mobility data management can bring valuable benefits to many domains characterized by the mobility of users and moving objects in general, such as traffic management, urban dynamics analysis, ambient assisted living, emergency management, mHealth, etc. The authors present the state of the art in the domain of management of semantic locations and trajectories and outline research challenges that need to be investigated to enable a full-fledged and intelligent semantic management of moving objects and location-based services that support smarter mobility. The authors propose a distributed framework for the semantic enrichment and management of mobility data and analyze the potential deployment and exploitation of such a framework. The applications for Atheer's Augmented Interactive Reality™ platform are limitless. Atheer sees a future where the physical and the digital converge to create a better, safer, and more open world. The researchers envision a new paradigm for computing and communications that enables everyone—from doctors and designers, to machinists, musicians, shipbuilders, and scientists—to work smarter and realize their full potential. The enterprise is just the beginning: it is only a matter of time before augmented interactive reality extends into the home and becomes embedded in people's everyday lives. The year 2104 was one of tremendous growth for the wearable technology industry, and 2015 was poised to be even bigger. Deloitte estimated the wearable tech industry would realize nearly $3 billion in sales by the end of 2014, and many experts predicted that 2015 would be the year that wearable technologies "crossed the chasm" to achieve mainstream adoption. Without a doubt, 2015 brought big changes in the wearable technology space as new players entered the market and existing players left or shifted strategies. To help consumers and businesses understand what they can expect to see happen in the market, APX Labs crafted several predictions for the wearable technology industry in 2015 and hopes these predictions provide valuable insight for readers. Innovate UK is offering six businesses up to £35,000 each to encourage innovation in wearable technology across the themes of sport and well-being, entertainment, hospitality, health and safety, and accessibility and design. Wearable technology and wearable research are enabling the next wave of innovation in cloud-connected wearable sports, fitness, eHealth, virtual reality, healthcare, and gaming sensor accessories for smartphones. Real-time 3-D body motion tracking data enable the development of apps that can recognize and classify complex motions such as sports techniques by digitizing the user's exact movements for immediate feedback and live sharing. Shana Baker, Federal Highway Administration. Interviewed February 5, 2015. Rochelle Carpenter, Nashville Area Metropolitan Planning Organization. Interviewed August 13, 2015. Ed Christopher, Federal Highway Administration. Interviewed February 5, 2015. Janet Fulton, Centers for Disease Control and Prevention. Interviewed March 23, 2015. Sherri Hunt, Environmental Protection Agency. Interviewed March 10, 2015. Stephen Intille, Northeastern University. Interviewed July 8, 2015. Santosh Kumar, University of Memphis. Interviewed September 1, 2015. Kevin Patrick, University of California, San Diego. Interviewed July 17, 2015. Prabasaj Paul, Centers for Disease Control and Prevention. Interviewed March 23, 2015. Victoria Peters, Federal Highway Administration. Interviewed February 5, 2015. William Riley, National Institutes of Health. Interviewed September 22, 2015. Francis Tsow, Arizona State University. Interviewed July 7, 2015. Castell, N., Viana, M., Cruz Minguillón, M., Guerreiro, C., & Querol, X. (2013). Real-world application of new sensor technologies for air quality monitoring. European Topic Centre on Air Pollution and Climate Change Mitigation Technical Paper. Bilthoven, The Netherlands. Retrieved January 20, 2016, from http://acm.eionet.europa.eu/docs/ETCACM_TP_2013_16_new_AQ_SensorTechn.pdf. Federal legislation establishes an Exploratory Advanced Research (EAR) Program for transportation to address longer term, higher risk, breakthrough research with the potential for dramatic long-term improvements to transportation systems, improvements in planning, building, renewing, and operating safe, congestion-free, and environmentally sound transportation facilities. The Federal Highway Administration's (FHWA's) EAR Program secures broad scientific participation and extensive coverage of advanced ideas and new technologies through stakeholder engagement, topic identification, and sponsored research. The uncertainties in the research approach and outcomes challenge organizations and researchers to be innovative problem-solvers, which can lead to new research techniques, instruments, and processes that can be applied to future high-risk and applied research projects. For more information, please visit the EAR Program Web site at https://www.fhwa.dot.gov/advancedresearch/.